To Villanger on the "Ships starting with V" page. They were taken by Frank Cyril Swannell (1880-1969) at Ogden Point, Victoria in 1940. Manager: Westfal-Larsen & Co., A/S Bergen. Tonnage: 4884 gt, 8200 tdwt. Delivered in Aug.-1929 from Sir W. G. Armstrong, Whitworth & Co., Newcastle. On charter to Ministry of War Transport from 1940 to 1945, then returned to Norway. Previously traded E & W coast Americas. July 31 Liverpool   ON 117 For NYC. Oct. 2 Liverpool New York City Oct. 20 ON 135 Convoy will be added. May 6 Clyde New York City May 21 ON 182 Convoy will be added. Aug. 27 New York City Avonmouth Sept. 12 HX 254 See also narrative below. Sept. 27 Milford Haven New York City Oct. 15 ON 204 Convoy will be added. Oct. 24 New York City Liverpool Nov. 8 HX 263 Convoy will be added. Dec. 22 New York City Liverpool Jan. 6-1944 HX 272 Convoy will be added. 1944 Jan. 24 Liverpool New York City Febr. 12 ON 221 Convoy will be added. March 31 Clyde New York City Apr. 16 ON 230 Convoy will be added. June 10 Clyde New York City June 28 ON 240 Convoy will be added. Aug. 10 Liverpool New York City Aug. 28 ON 248S Convoy will be added. Oct. 12 Liverpool New York City Oct. 29 ON 259 Convoy will be added. Dec. 9 Liverpool New York City Dec. 28 ON 271 Convoy will be added. 1945 Jan. 23 New York City Southend Febr. 7 HX 334 See also narrative below. Apr. 18 New York City Liverpool May 3 HX 351 Convoy will be added. Dec. 11* Maraham Guaira Dec. 21 Independent *Page 6 gives departure Dec. 14. For information on voyages made prior to (and in between) those mentioned here, please see the documents received from the National Archives of Norway and A. Hague's Voyage Record above. Follow the convoy links provided for more details; the Commodore's notes are also available for some of them, and several Norwegian ships took part. According to Page 1 of the archive documents, Villanger was on her way from Bahia to Maranham when war broke out in Norway on Apr. 9-1940 (as can be seen, she had quite a long stay in Buenos Aires that summer). Her 1941 voyages start on Page 2 and continue on Page 3. It'll be noticed that she appears to have spent a long time in Vancouver that year. She had arrived there on Aug. 16 and departure is given as Oct. 4. Her 1942 voyages also start on this document. 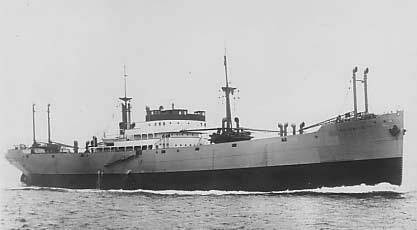 In the summer of 1942, she's listed in Convoy SL 114, which departed Freetown on June 25. She had a general cargo for Mersey and had station 65 of the convoy. The Norwegian Belnor, Norholm, Solfonn and Vanja are also listed, as is Norbris (Panamanian flag, Norwegian managers, listed under the N's on this website). Sveve was scheduled but did not join (sailed in the next convoy). Villanger arrived Liverpool on July 16, and at the end of that month, she can be found in the westbound North Atlantic Convoy ON 117*, departing Liverpool on July 31. She arrived New York on Aug. 15, the convoy having been dispersed that same day - her voyages in this period are shown on Page 4. With a general cargo for Mersey, she headed back across the Atlantic on Sept. 6 in Convoy HX 206 from Halifax, returning the following month with Convoy ON 135*, which left Liverpool on Oct. 2 and arrived New York Oct. 21. On Nov. 3, we find her in the New York-U.K. Convoy HX 214, bound for Belfast Dock and Cardiff, arriving Cardiff on Nov. 20. As will be seen when following the link to my page about this convoy, the Commodore says she was 1 of 3 ships that smoked very badly, all having flames coming from their funnels on occasion. Her last Trans-Atlantic voyage that year was made with the westbound Convoy ON 153, in which Bello and others were sunk. Follow the links for more details. She went back to the U.K. in Jan.-1943 in Convoy HX 223 in which Kollbjørg and Nortind were lost; again, follow the links for more info. The Norwegian Brasil, Brimanger and Egda also took part. Villanger arrived Cardiff, via Belfast Lough, on Febr. 3, remaining there for over 3 weeks. She later returned with Convoy ON 170, which departed Liverpool on March 3 and arrived New York on the 20th - according to Page 4, Villanger sailed from Milford Haven on March 2. On Apr. 6, she headed in the other direction with Convoy HX 233 from New York, sailing in station 54, general cargo and explosives, then in May, we find her in Convoy ON 182*, which originated in Liverpool on May 6; Villanger sailed from Clyde that day and arrived New York May 21. She's now listed, with a general cargo for Liverpool, in station 21 of Convoy HX 243, leaving New York on June 7, arriving Liverpool on the 21st, subsequently joining Convoy ON 192* back to New York on July 9 (Commodore in Laurits Swenson). Villanger arrived New York on July 23, remaining there for over a month. She was scheduled for Convoy HX 253 from New York on Aug. 20, but instead joined the next convoy on Aug. 27, HX 254, general cargo, destination Avonmouth Dock, station 112. She arrived Avonmouth on Sept. 12, and later that month she joined the westbound Convoy ON 204*, originating in Liverpool on Sept. 28, arriving New York Oct. 15; Villanger started out from Milford Haven on Sept. 27 (Page 4). A. Hague now has her returning to Liverpool in Convoy HX 263* from New York on Oct. 24, with arrival Liverpool Nov. 8, general cargo and explosives, station 113, later joining the westbound Convoy ON 212, which arrived New York on Dec. 4. The only other Norwegian ships in this convoy, except for the escorting corvettes Eglantine, Rose and Potentilla, were Vav, Fjordaas and Spinanger. According to A. Hague, she returned to Liverpool with Convoy HX 272*, departing New York on Dec. 22, arriving Liverpool Jan. 6-1944 - see also Page 5. On Jan. 24-1944, she's listed in the westbound Convoy ON 221* back to New York. This time, Acanthus is named among the escorts - see ON convoy escorts. Villanger headed back to the U.K. again on March 6 in Convoy HX 282, general cargo for Glasgow, where she arrived on March 21, then at the end of that month, she joined the westbound Convoy ON 230*, which sailed from Liverpool on March 30; Villanger left Clyde on the 31st and arrived New York Apr. 16. She remained in New York until May 10, when she's listed in Convoy HX 291, which included several other Norwegian ships, among them Heranger, Høyanger (Vice Commodore Ship), O. B. Sørensen, Para, Vav, Stirlingville, Minerva, Velox and others (follow convoy link for a complete list). Villanger had a cargo of ammunition and vehicles and she was again bound for Glasgow, where she arrived May 26 (Page 5). In June, she joined the westbound Convoy ON 240*, which originated in Liverpool on June 10 and arrived New York on the 28th (Villanger joined from Clyde - Vice Commodore in Høyanger). With a general cargo for Liverpool, she left New York again on July 11, joining Convoy HX 299, for which Laurits Swenson served as Commodore Vessel, while the Vice Commodore was again in Høyanger. The following month, Villanger appears in the westbound Convoy ON 248S*, departing Liverpool on Aug. 10. She arrived New York on Aug. 28, heading back across the Atlantic on Sept. 13 in Convoy HX 308, general cargo for Liverpool (Page 5). On this occasion she acted as the Vice Commodore's ship, having A. J. Baxter, R.N.R. on board. She left Liverpool again on Oct. 12, joining Convoy ON 259*, which arrived New York on the 29th. In fact, this time she served as Commodore Vessel, with the Norwegian R. G. Bruusgaard as Commodore, while Laurits Swenson's captain served as Vice Commodore. On Nov. 9, Villanger left New York in Convoy HX 319, again acting as Commodore Vessel (R. G. Bruusgaard, Commodore). She was again bound for Liverpool with general cargo, arriving there on Nov. 25. She had time for one more Trans-Atlantic voyage before that year was over, and this was made in the westbound Convoy ON 271*. She arrived New York on Dec. 28, having left Liverpool Dec. 9 (she had served as Commodore Vessel again). Villanger now remained in New York for almost a month. She was scheduled for Convoy HX 333 on Jan. 18-1945, but instead joined the next convoy on Jan. 23, HX 334, for which Samuel Bakke served as the Commodore's ship. Acanthus is again named among the escorts. Villanger was bound for Hull with general and explosives, arriving there on Febr. 9, according to Hague's Voyage Record above. In March, she sailed in the westbound Convoy ON 288* with 9 other Norwegian ships, namely Viggo Hansteen, Dageid, Tanafjord, Slemmestad, G. C. Brøvig, Polartank, Heranger, Harald Torsvik and Høyanger, according to "Nortraships flåte", which adds that the Norwegian Commodore R. G. Bruusgaard was in Port Fremantle. A. Hague has instead included Høyanger in the next convoy. ON 288 departed Southend on March 2 and arrived New York on the 19th and Villanger again had a long stay there - see Page 5. A. Hague now has her in Convoy HX 351* (Commodore in Laurits Swenson), which left New York on Apr. 18 and arrived Liverpool May 3, and that's where VE Day was celebrated. Her last convoy voyage of the war was made in Convoy ON 303*, departing Liverpool on May 17, arriving New York June 2 - in fact, she served as Commodore Vessel for this convoy. According to A. Hague, she was involved in a collision on May 27; I have no further details on this, but Skotaas, which also took part in this convoy, is also said have collided on that date, as did the American John B. Hood. Other ships are also said to have collided in this convoy, but the date is either not given, or it occurred later on in the passage. My page about Anna Knudsen has an explanation as to the cause of some of these collisions, saying that the Commodore in Villanger ordered a "double emergency turn" in thick fog, after one of the escorts had sighted icebergs ahead of the convoy. Having misunderstood this order, several ships collided when making a 45° turn instead of the "double" 90° ordered. Villanger did not leave New York again until July 20, so it's possible some repairs had been required(?). Her subsequent voyages are shown on Page 5 and Page 6 (to March-1946). * The ON convoys mentioned here will be added to individual pages in my Convoys section in due course, with more information on each. In the meantime, the ships sailing in them (and escorts) are named in the section listing ships in all ON convoys. The entire HX series will also be updated and completed (including the already existing convoys - some have already been updated), but for now, please see ships in all HX convoys. Escorts can be found on this page. All these are based on Arnold Hague's database. As will be seen, they all had several Norwegian ships. Sold in Nov.-1954 to Blyth Dry Docks & Shipbuilders. Taken over by Mollers Ltd., Hong Kong. Sold in 1955 to Harbour Line Ltd., London, and renamed Castle Harbour. Sold during May-1959 to Hong Kong breakers, having been laid up at that port since March 11-1959. Back to Villanger on the "Ships starting with V" page. Another Villanger was delivered to Westfal-Larsen in July-1958, built by J. L. Thompson & Son, Sunderland, 9347 gt. Sold in May-1974 to Arne Teigens Rederi A/S, Egersund (Bruusgaard Kiøsterud Skips-A/S), renamed Ryttervik. Renamed Hai Hing in 1976. Taken over by p/r Ryttervik (Thoresen International), Egersund in 1977. Sold in 1979 to Lugar S.A., Panama. Sold in 1980 to Selco Hong kong Ltd., Hong kong. Broken up in Pakistan in 1981. The text on this page was compiled with the help of: "Nortraships flåte", J. R. Hegland, "The Allied Convoy System", Arnold Hague, E-mails from Roger W. Jordan (post war info) and misc. - (ref. My sources).